As popular television “roasters” would ask — Is that too much? Did I go too far? Is it just too soon? 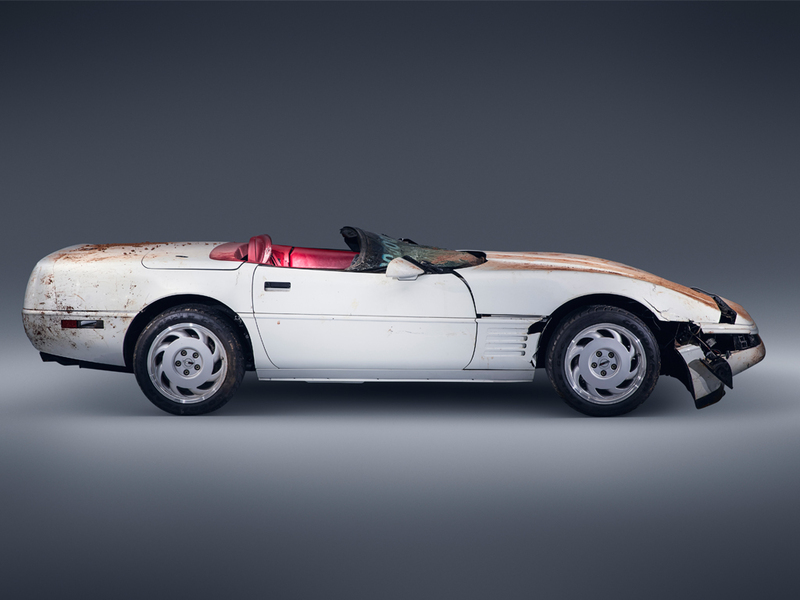 After all, the 2001 Chevrolet Corvette Z06 so skillfully modified by Mallett Cars, Ltd. (of Cornelius, North Carolina) was only recently donated to the National Corvette Museum where it fell into a deep chasm that opened up in the Earth’s surface early on the morning of February 12, 2014. The Mallett Z06 was among a group of eight rare and valuable Corvettes that fell into the sinkhole. 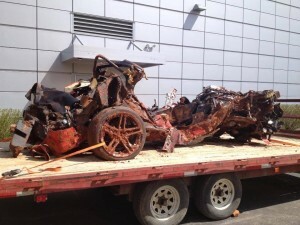 Seven of the affected cars were removed and are on display in a specially designated area of the museum and the Mallett Z06 was the final car to be excavated. Damage was expected to be extensive but no one was ready for the mangled piece of tin that came forth. As the eight Corvettes fell into the sinkhole, they piled on top of one another along with huge portions of concrete which had broken away from the floor. It would seem, after looking at these images of the Mallett Z06, that a tremendous amount of weight was placed directly upon the entire body of this car, completely flattening it. Chevrolet has vowed from the beginning to restore the damaged cars which are on display at the National Corvette Museum through August. The pros at Chevy will certainly have their work cut out for them with this one. 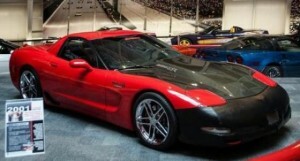 The 2001 Mallett Corvette Z06 differs from many of the other Corvettes in the National Corvette Museum primarily because of its degree of aftermarket modification. Most of the Corvettes on display in Bowling Green, Kentucky are rare factory original or factory modified creations. Mallett Cars Limited is a firm that specializes in high-performance modifications for every aspect of the vehicle — from horsepower to appearance. 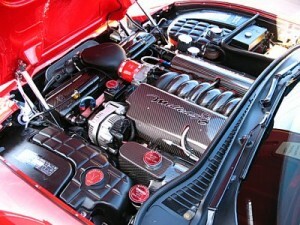 A typical Mallett performance enhancement package, for the already potent 2001 Z06 (with a 5.7-liter V8 engine), would include a custom racing camshaft, custom ported LS6 cylinder heads, and “D” port exhaust headers. 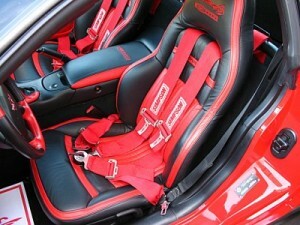 These modifications would yield a total rating of 475-horsepower for the Z06. Additionally a custom Mallett billet short throw shifter, Penske/Mallett 7500-Series nonadjustable shocks, leather seats with the Mallett logo sewn in, a Mallett serial number plate, and Mallett body graphics kit would also be added for appearance and driving convenience. 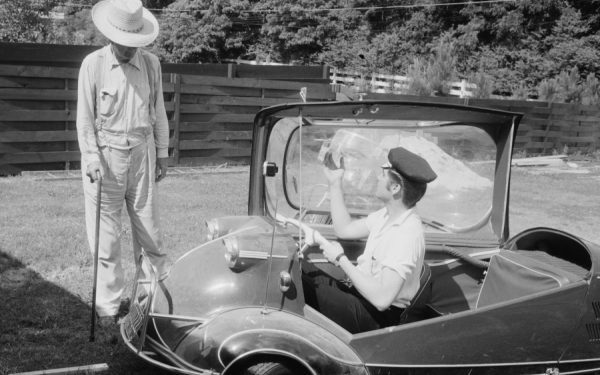 The car that was donated by the Helmintrollers was outfitted with a full racing roll cage, racing harnesses, a 6.1-liter stroker kit (which provides the engine with additional horsepower for an approximate yield of 525-hp), a high-performance clutch kit, and high-flow catalytic converters among many, many other improvements.